A light clean for the most important areas of your home. 3 - 5 hours, for 4-6 bedroom homes book between 4 - 7 hours. Cleaning time recommendations: 1-3 bedrooms homes book between 2.5 - 4.5 hours, for 4-6 bedroom homes book between 4 - 6.5 hours. 2 - 4 hours, for 4-6 bedroom homes book between 3.5 - 6 hours. Ready to book your clean? What WILL we do that other house cleaning companies don't? Provide an instant quote for our services through our pricing calculator. 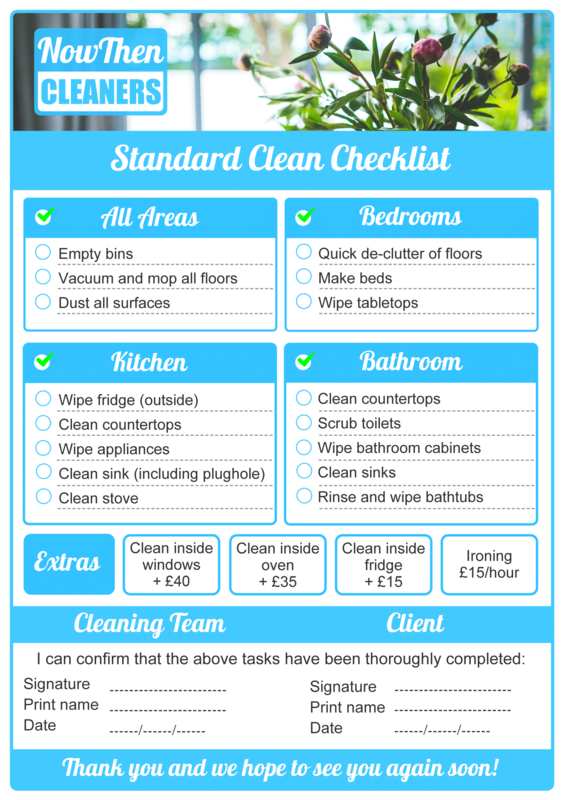 Detail exactly what we will deliver in our comprehensive services shown on our cleaning checklists. Reward your loyalty, we offer fantastic discounts for regular cleaning. What WON'T we do that other house cleaning companies do? We won't need to visit your home to provide a quote and delay your booking any further. Provide a vague hourly estimate, that could increase after the job has been completed. Leave you unhappy about what cleaning tasks have been completed, you will know exactly what has been done. What services are not included? Exterior window cleaning, Deep stain removal, Animal waste removal, Infestation, Mould removal, Insect removal. "I've used NowThen for one house clean and was so happy with them that I use them for the offices on my construction site. The ladies have always been friendly and excellent at what they do (and I'm VERY fussy about cleaning!). I'd definitely recommend." "Great cleaners. The team are always happy to help and really friendly. The cleaners are always on time and leave the house very clean indeed." "I have had now and then cleaners for several months now. I initially booked a one off clean and loved living in my beautifully cleaned house so much I decided to book 2.5 hours once a fortnight to keep on top on main rooms." You have come the right place to book a professional house cleaning service in Sheffield. We service all of Sheffield and surrounding areas, to check where we clean and unsure if you have a 'cleaning service near me' visit our where we clean page. We also offer commercial cleaning services if you want a high quality clean for your workplace. Book a home cleaning service that matches your needs and requirements, it only takes 60 seconds! With clear pricing and a thorough checklist, you know exactly what we promise to deliver. If you’re not satisfied with our work, we’ll send someone back immediately. It’s as simple as that. Registered Office: Unit 207 Meersbrook Enterprise Centre, 19 Valley Road, Sheffield, United Kingdom, S8 9FT. Company No. 09640551.